Please properly dispose of pet waste to prevent it from entering our waters. Clean water is important to our health and economy. Clean water provides recreation, wildlife habitat, drinking water, and adds beauty to our landscape. Everyone benefits from clean water. Pet waste is a health risk to animals and people. Pet waste is full of bacteria that can cause illness. When it rains, harmful bacteria are washed into our storm drains and end up in our lakes, streams and marine water. When humans eat fish and shellfish from these waters it could be contaminated and harmful. We’re looking for even more reasons to pick up after your dog. Send your best reason for picking up pet waste and a photo of your dog to: martink@swmpc.org. If your idea is selected, your dog will be featured in upcoming Canines for Clean Water education materials. Each day dogs do their business in yards, on boulevards and in parks. Improperly disposed of dog waste negatively impacts water quality in our lakes, creeks, ponds and ends up in Lake Michigan! 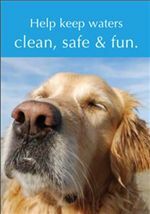 We want every dog guardian in southwest Michigan to take the Canines for Clean Water pledge and become better stewards of our treasured water resources. I will scoop up and dispose of dog waste in a garbage can. I will prevent my dog from doing its businesses in any lake, creek, river, wetland or other water body. I will carry an extra dog bag and offer to another dog guardian when needed. Click here to view or print the pledge form! Click here to view or print the Canines for Water Quality handout! If you would like to print information about pet waste in your community's newsletter click here.